Carole Halvorson announces the "Books You Should Have Read in School, but missed" book club, beginning July 27, 6 p.m. at the Bohenkamp/Community Workshop Bldg in La Grande. The Workshop is located at 1301 Adams Ave, La Grande, and the book club is open to all. The first book to be discussed is Mark Twain's classic Adventures of Huckleberry Finn. This book has been widely discussed and sometimes censored for its frank and uncomfortable treatment of race and status in our nation's recent past. 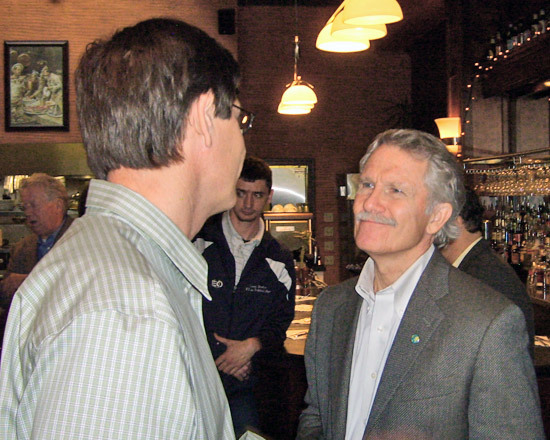 La Grande residents came together to meet with Oregon's nominee for Governor in 2010, John A. Kitzhaber. The event was very well attended even though the meeting was added to the former Governors' schedule at the last minute. The meet-up took place at Foley Station in downtown La Grande on Wednesday, June 2, 2010. Former Governor Kitzhaber fielded questions about taxation, local USDA meat certification, health insurance costs. education costs and more. He was very comfortable with the crowd, offered direct answers to questions, and had a good grip on all the issues addressed. For more information on the Kitzhaber campaign visit http://www.johnkitzhaber.com/. The U.S. House of Representatives will soon vote on health care reform legislation. This legislation will make health care affordable for the middle class, provide security for seniors, and guarantee access to health insurance for the uninsured – while reducing the federal deficit by over $100 billion over the next decade. This analysis examines the benefits of the legislation in the 2nd Congressional District of Oregon, which is represented by Rep. Greg Walden. Improve coverage for 417,000 residents with health insurance. Give tax credits and other assistance to up to 217,000 families and 22,100 small businesses to help them afford coverage. Improve Medicare for 142,000 beneficiaries, including closing the donut hole. Extend coverage to 94,000 uninsured residents. Guarantee that 17,800 residents with pre-existing conditions can obtain coverage. Protect 1,400 families from bankruptcy due to unaffordable health care costs. Allow 57,000 young adults to obtain coverage on their parents’ insurance plans. Provide millions of dollars in new funding for 39 community health centers. Reduce the cost of uncompensated care for hospitals and other health care providers by $83 million annually. The health reform bill passed last night is a victory for all Americans -- families, seniors, workers and small businesses. Americans now have the security of knowing that they will not have to watch the American dream slip away if they get sick or are in an accident. Beginning this year, health reform will bring down costs for families and small businesses, it will end the worst insurance company practices and it will expand coverage to millions of Americans. This year, Americans will start to see significant benefits because of this bill and other important reforms will follow. American families and small businesses will see costs go down immediately because of this bill. Make providing employee coverage more affordable for small businesses by giving a tax credit of up to 35% of premiums to small businesses that choose to offer coverage. Create a temporary high-risk pool to provide affordable insurance options to adults who are denied coverage because of pre-existing conditions. Provide a $250 rebate for Medicare recipients who fall in to the Part D donut hole - the first step towards closing the donut hole for good. The bill will also provide a 50% discount on prescription drugs which fall into the donut hole beginning in 2011. Require new private plans to cover preventative care - with no co-payments or deductibles. The Union County Democrats are planning a house party for March 24, 6-8 p.m. to welcome Joyce Segers to the county and to meet with our other local Democratic candidates. Joyce is running against Greg Walden for the second Congressional District seat. Visit http://joycesegers.com/ for more information. We would dearly like someone to step forward and volunteer their home and will need other volunteers to bring an appetizer, dessert or beverage. If you are interested in opening your home, please send me an email. If you can bring food or beverage, contact Sharon Evoy at sharonevoy[at]eoni.com. Ideally, we need to hear from you within the next few days. Here is our thinking on this party. While it would be lovely to have the meeting downtown and support a local business, we want the precious dollars that folks can spare to go to the candidates. This will be a friendly, simple drop-in open house. We will not attempt to coerce your vote or put you on a committee. This is a chance to say hello and have a conversation with our Democratic candidate(s). It’s important to remember where we were when President Obama took office. The President inherited the worst economic crisis in a generation, and our country was teetering on the edge of another depression. The economy was losing 700,000 jobs a month on average. Banks were in crisis and lending was frozen. $10 trillion in wealth was lost in the stock market. Now almost a year later, President Obama has taken necessary steps to stabilize our economy, put us on the road to recovery, and rebuild a new, stronger foundation for long term growth. On the economy, equal rights, our health care system, our energy policy, our financial regulatory system, the environment, valuing science and service, restoring our reputation around the world and setting the special interests straight, President Obama is enacting an ambitious agenda that is helping to get our economy moving again and changing the way things in Washington get done. Dear colleagues: We are at a potentially watershed moment in history. For the first time ever single-payer health insurance will be voted upon on the floor of the House of Representative following the current congressional recess. We need your support. Please contact Rep. Greg Walden (R-OR) and urge support for the Weiner amendment to HR 3200. The Weiner amendment substitutes the language of HR 676 (the Conyers/Kucinich single payer bill) for most of the language in HR3200. I met with Rep. Walden when I was in Washington, DC for the Medicare:Made in America single-payer rally and lobby day last week. I contended that single-payer is the most fiscally conservative approach to health insurance reform. He listened attentatively and asked his staff to review the materials I left for him. I believe there is a possibility that he will support single-payer if enough constituents contact him. Speaker Pelosi agreed to a House floor vote in order to avoid the possibility of Republicans joining progressive Democrats and winning the substitution in committee, to the embarrassment of the Democratic leadership. The fear was that, having transformed the bill in committee, Republicans and Blue Dog Democrats wouold kill any possibility of legislation on the floor. We need to mobilize progressive Democrats and allies to urge our representatives to support the Weiner amendment. With your help history is ours for the making. Thanks for all you are doing. Please share this information with colleagues throughout Oregon. The PNHP memo below contains full detils and provides a lnk to Kaiser Family Foundation side by side analysis of all the health insurance reform proposals currently before Congress. Kathleen wants you to download these files to support the Community Baby Shower program and the Attorney General John Kroger Breakfast. Download these Adobe Acrobat files, print them out and post them around town! Download this Community Baby Shower Drop Box Sign (Adobe Acrobat format), print it out and put it on your drop box! Don't have Acrobat Reader? Just click on this Adobe icon to get the Adobe Reader.